Fence posts, that is, and power poles. Spent most of this afternoon working on "Sentinels" -- applying the stone out-cropping, adding some thread painted bush, and the aforementioned P&P. When I finished I trimmed off the batting as it was getting cumbersome. Then I had to block it a wee bit. The sky quilting is denser (more dense?) than the snow quilting, so it nipped in about 1/8 inch on one side. the blocking seems to have evened this out. I only hope it will last during the last of the thread painting and on into the facing stage. In the trimming, I lost a bit of the top of the pole on the far left, but I think in the end that will give the piece interest. I have to admit I really like the way the fence line shaped up. It's all little bits of the same fabric as the power poles, all drawn onto the paper side of Steam-a-Seam 2, which I like when I want a bit of a stickiness in order to place a piece onto the background and have it stay there while I'm considering it -- before ironing it into place permanently. Next I need to stitch down the P&P, add power lines and barbed wire traces, and some more grasses. There's a large swath at the bottom of the piece that looks very bare right now; that's where the grasses belong. I checked the proportions against the photograph, and to be precise, that area between the last fence post on the right and the bottom of the piece should be 8.8"...Nine is close enough for me! And simply for a change of page, I finished another Block B for Easy Street. Only 3 more to go, and I can start figuring out how it all goes together! 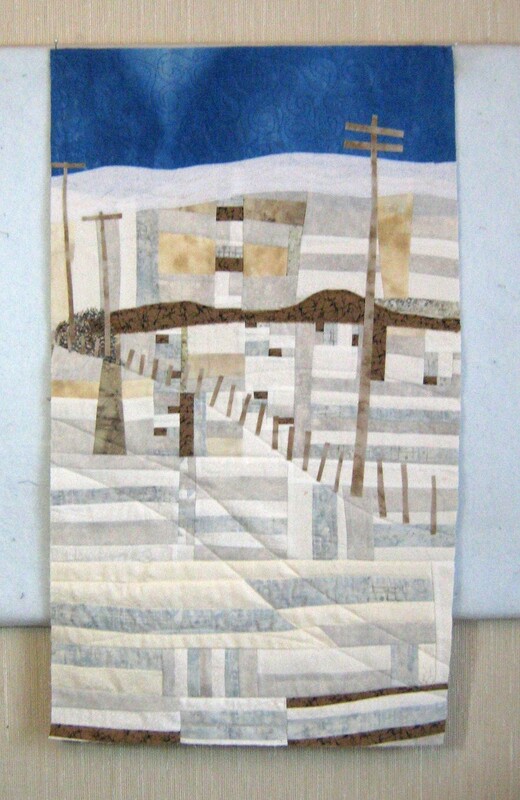 "Mountainscape I", the mock-up for the door quilt, met with approval when displayed yesterday, so now I have to plan the larger piece -- in between getting show pieces ready, that is. The SAQA "Santa Fe Spotlight" miniature is already on its way to the curator of the auction, but a stack of fabric lies waiting for me to make some more of those, too. Never a dull moment! There is something satisfying to me when I see posts and poles. Nice! This is really beautiful, Margaret. I like the fence and posts, looking good. 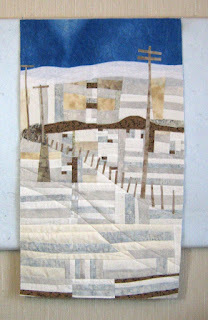 Margaret, I really LOVE this piece--the fence turned out really good and I like the way you stitched the sky. This is a great abstraction of the original photo, as it takes it down to the basics. Glad you enjoyed the free-piecing. You used it most effectively.